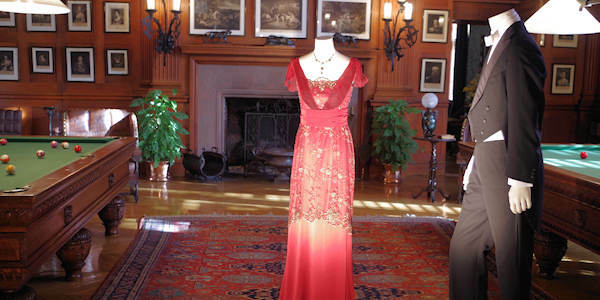 Biltmore House becomes the scene of a festive celebration hosted by George and Edith Vanderbilt in a new clothing exhibition. Sourced from information gleaned from Vanderbilt letters, photographs and documents, experience the time when the Vanderbilts entertained family and friends to Biltmore. The Vanderbilts’ clothing, re-created by Academy Award-winning costumier John Bright, will be featured along with a new audio-guided tour (free with all online ticket purchases) that uses innovative 360-degree sound techniques. See our Vanderbilt House Party Guide. Watch the progression of 100,000 spring blooms including tulips with stunning floral displays across the estate that celebrate the majesty of Frederick Law Olmsted’s legacy. Biltmore’s restaurants will include special menu items, with the Winery offering specialty tours. 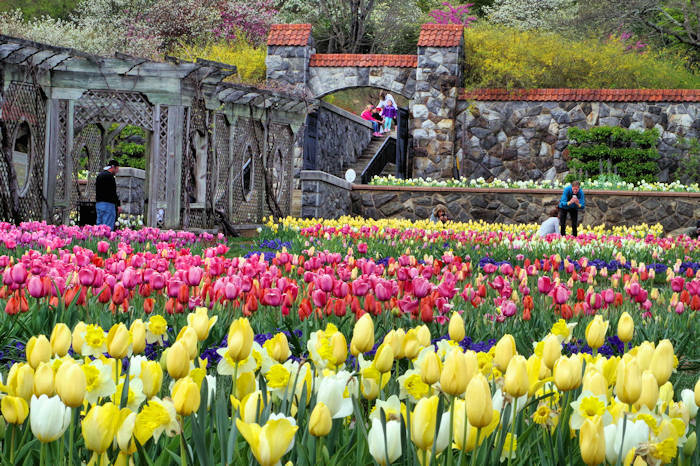 See our Biltmore Blooms Guide. The Easter Rabbit makes his annual appearance on Biltmore’s Front Lawn on Easter Sunday, along with special children’s entertainment and grand Easter Egg Hunts. Children 9 and younger may attend the hunt for free when accompanied by an estate pass holder or a ticketed adult. Biltmore’s Conservatory by the Walled Garden will be the site of Biltmore Gardens Railway, a botanical model train display featuring small-scale replicas of the estate’s structures. These will include miniature constructions of Biltmore House, the Lodge Gate and Conservatory, created from natural elements such as leaves, bark and twigs from estate grounds. With 800 feet of rails and trains traversing six separate lines at different eye levels, this will be fun for all ages. On several evenings, Biltmore House and the Blue Ridge Mountains serve as backdrop for amazing musical experiences on the South Terrace. The concert line-up will be announced in spring 2019. See our Biltmore Concert Series Guide. See fall colors and enjoy many special events. See our Fall at Biltmore Guide. 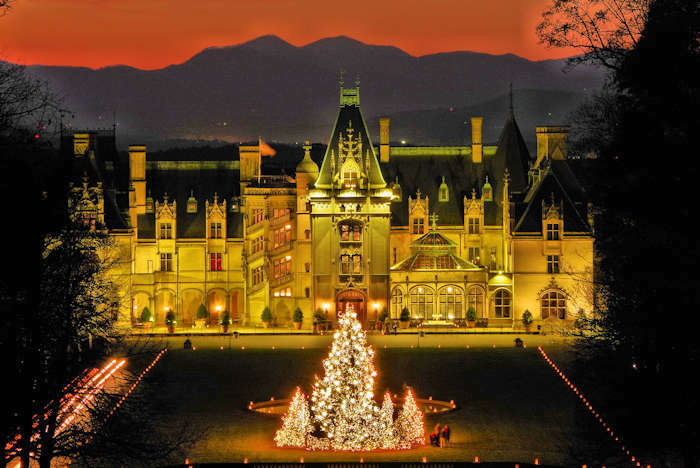 Go to the Biltmore Estate Web site to buy advance discount tickets! 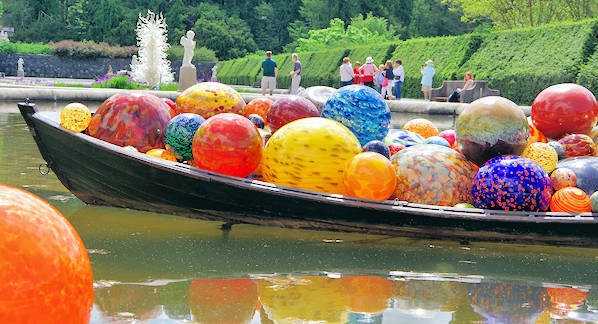 Chihuly at Biltmore: This Summer 2018 exhibition of monumental glass sculptures by multi-media artist Dale Chihuly took over the gardens! Read more. Titanic Movie Costumes 2018: The first large-scale exhibition of fashions from Oscar-winning “Titanic” movie was a show-stopper! Titled “Glamour on Board: Fashion from Titanic the Movie”, 53 costumes were inside the house and other locations on the estate. 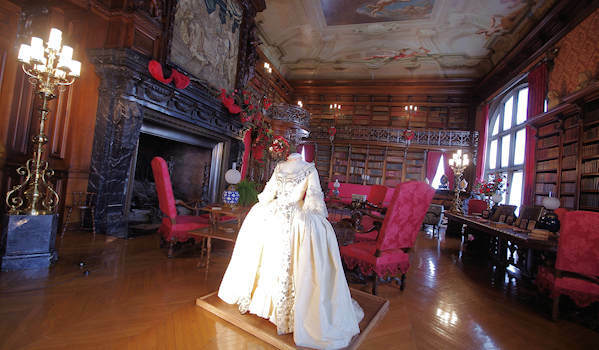 Movie Wedding Gowns 2016: Biltmore presents another spectacular exhibition “Fashionable Romance: Wedding Gowns in Film,” featuring 41 wedding gowns and groom's attire from major motion pictures. As impressive as the costumes are, the elaborate floral displays throughout the house (with thousands of roses) steal the show. 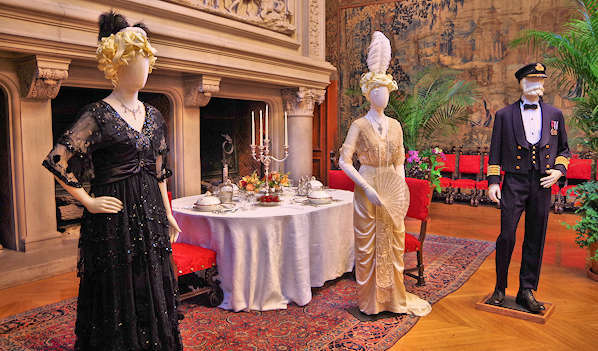 Downton Abbey 2015: Biltmore's first costume exhibition featured the popular PBS series.